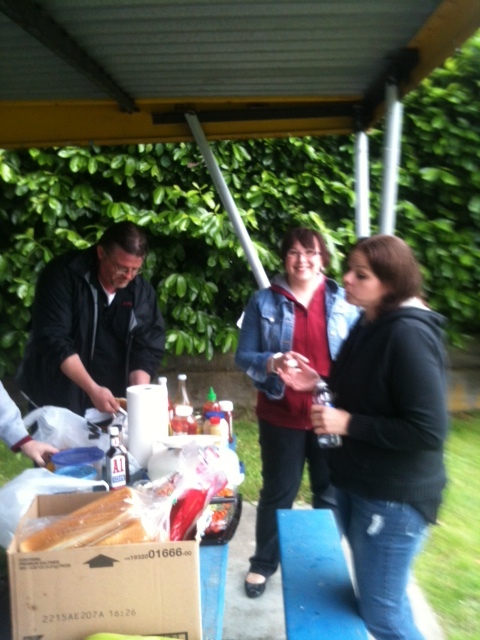 Last night my small group finished our semester with a cookout (it was a cookout, not a barbeque–barbeque is a technical and specific word that does not apply to just any old thing cooked on a grill) in a local park. The weather was lousily cold and windy but the food was spectacular: Rice Krispy treats, polish dogs, hot dogs, hamburgers, veggies, pasta salad, baked beans, and lumpia. I personally may have eaten 15 Rice Krispy treats. Our small group values food. We are thinking of change our name next year to The Foodie Small Group. We’ll see. We will take the rest of the summer off and then kick it up again in September. All of us will miss it in one way or another because our small group has become an important part of who we are. The longer I am involved in active ministry, the larger I view the role of the small group in individual spiritual growth. I still believe in the primacy of corporate worship, but the small group is important for some very specific reasons. First, it is in small group that I build meaningful relationships with people I see and expect to see week in and week out. Second, from the small group relationships are nurtured ‘on the side.’ Because we study together, I have often gotten together with people in my small group to do other things. Third, studying the Bible in smaller units of people creates an environment that encourages questions, discovery, and debate. We are not all alike and some of us in the small group are at different spots on the Christ-journey. Fourth, I am more accountable to participate and to belong in a small group. If someone misses two or three weeks, we are all over it. They will find out we miss them. Sixth, our particular small group has emerged as an inter-generational unit. It was originally meant for younger folks with children, but that is not how it evolved. We now have couples at various ages from their 50’s to 20’s and some are married and some are not and all of our children are always around. I think that is how Jesus likes us to exist; not as niche groups with only people who look and smell like one another. Some of our number were missing–caring for sick family, recovering from illness, or at work but they were missed and were with us in spirit. Saturday we meet one more time for our service project–a morning working at a Habitat for Humanity house. I remember been led to another church but just had such a hard time leaving my small group, made up of married, singles and people i never thought I would be close enough to covet their prayer support. I have at times felt a small group is the closest to an Acts 2 type of church. yeah, our relationships are forged in close knit community and those become the ties that bind.